The circular channel dialog box is shown below. Flow Unit – Select the desired flow unit. Head Loss Equation – Choose between the Manning, Kutter, Darcy-Weisbach (Colebrook-White) and Hazen-Williams friction loss calculation methods. 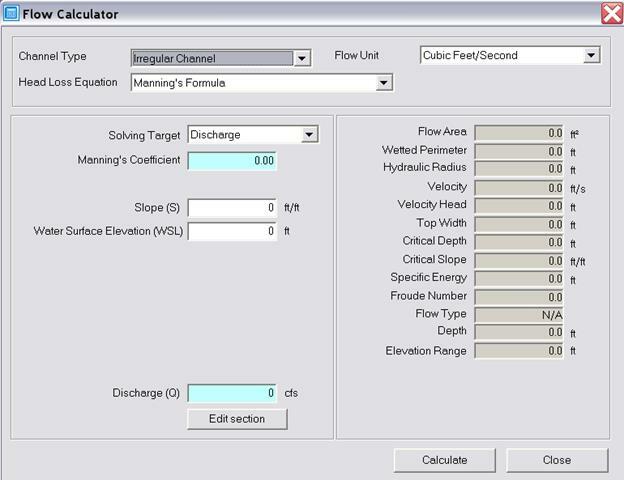 Solving Target – Select the hydraulic parameter to solve for. Coefficient – The channel roughness coefficient. Slope – Channel longitudinal slope. Depth – Channel normal depth. Diameter – Circular channel inside diameter. Flow Area – Flow cross-sectional area. Wetted Perimeter – Channel wetted perimeter. Hydraulic Radius – Flow area divided by the wetted perimeter. Velocity Head – Energy of flow velocity. Top Width – Length of free top water surface (zero for full flow condition). Critical Depth – Depth of water under minimum specific energy. Critical Slope – Channel slope under critical depth. Specific Energy – Velocity head plus pressure head. Froude Number – Flow characteristics dimensionless parameter. Flow Type – Subcritical or supercritical flow characteristics in channel. Percent Full – Percentage of actual channel flow depth based on full flow. 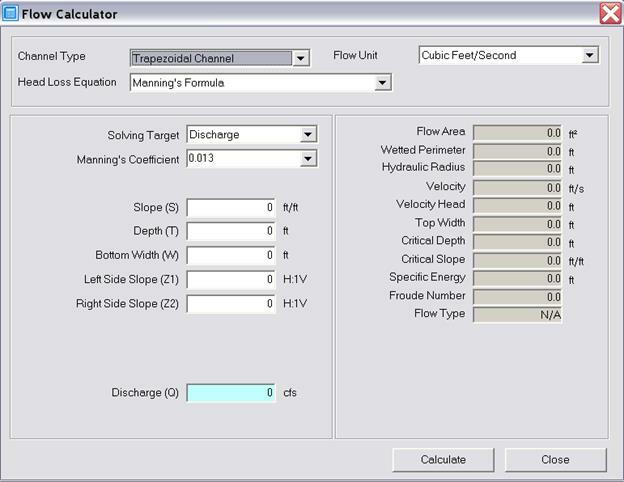 Full Discharge – Channel flow rate when flowing full. Full Slope – Channel slope under full flow. 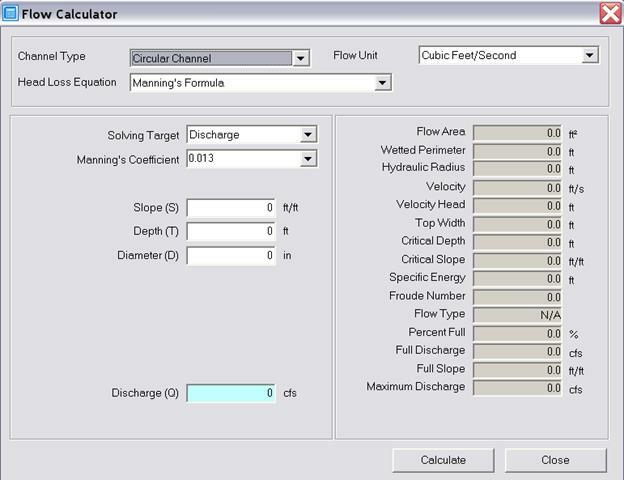 Maximum Discharge – Flow rate when flow depth equals 0.938 times circular channel diameter (applies only to circular channel). Discharge (Q) – Uniform channel flow rate. The rectangular channel dialog box is shown below. Bottom Width – Width of the channel. Flow Area – Wetted area. Top Width – Length of free top water surface (same as bottom width at all depths). The triangular channel dialog box is shown below. Left Side Slope – Horizontal increase in channel width per unit increase in depth (H: 1V) for the left side of the channel. Right Side Slope – Horizontal increase in channel width per unit increase in depth (H: 1V) for the right side of the channel. Top Width – Length of free top water surface. The trapezoidal channel dialog box is shown below. Bottom Width – Bed width of the channel. The irregular channel dialog box is shown below. Water Surface Elevation – Elevation corresponding to the water depth. Channel Cross Section – Station vs. Elevation data that represents shape of the channel. The Edit Section button initiates the irregular channel editor shown below. Left Bank Coefficient – Roughness coefficient for the left bank of the channel. Right Bank Coefficient – Roughness coefficient for the right bank of the channel. Channel Coefficient – Roughness coefficient for the main (center) channel. Main Channel Bank Stations – Stations at which the main channel ends and the banks start from either side of the channel (i.e., left and right). Elevation Range – Difference in elevations at the top and at the bottom of the channel. 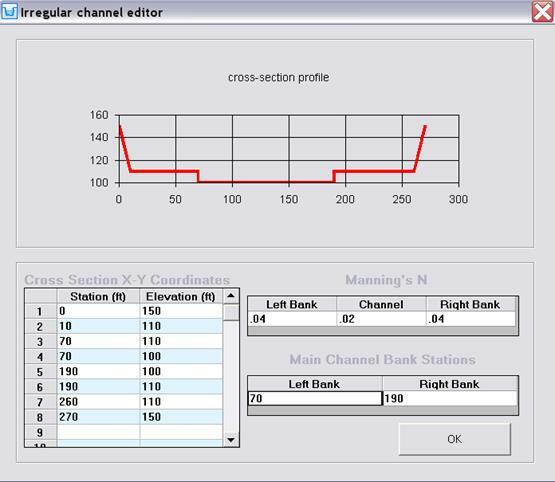 The dialog box for irregular channel cross-section editor is shown below. The inputs are described above along with the irregular channels inputs. 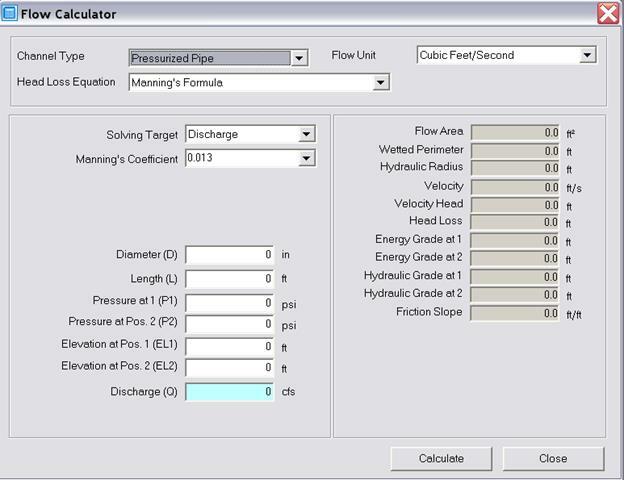 The pressurized pipe calculator applies the energy equation between two points (points 1 and 2) and evaluates the outputs listed below. The pressurized pipe dialog box is shown below. Diameter – Circular pipe diameter. Pressure at 1– Pressure at the upstream end of the pipe. Pressure at 2– Pressure at the downstream end of the pipe. Elevation at 1– Elevation at the upstream end of the pipe. Elevation at 2– Elevation at the downstream end of the pipe. Head Loss – Energy loss due to friction. Energy Grade at 1 – Total energy head (i.e., sum of pressure head, velocity head, and elevation head) at the upstream end. Energy Grade at 2 – Total energy head (i.e., sum of pressure head, velocity head, and elevation head) at the downstream end. Hydraulic Grade at 1 – Sum of pressure head and elevation head at the upstream end. Hydraulic Grade at 2 – Sum of pressure head and elevation head at the upstream end. Friction Slope – Slope of the head loss due to friction between sections 1 and 2. 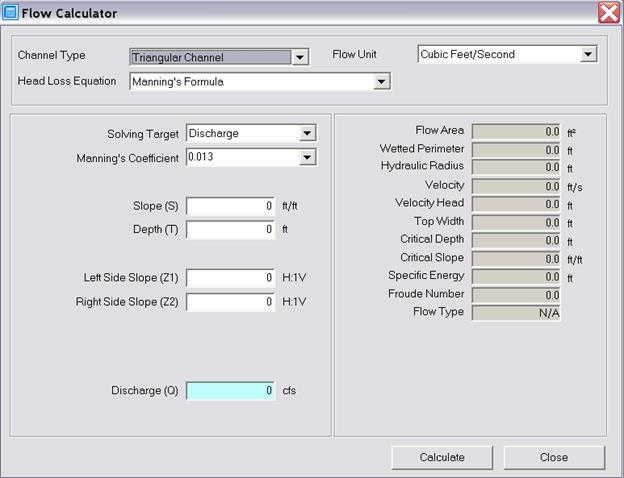 Discharge (Q) – Pipe flow rate. 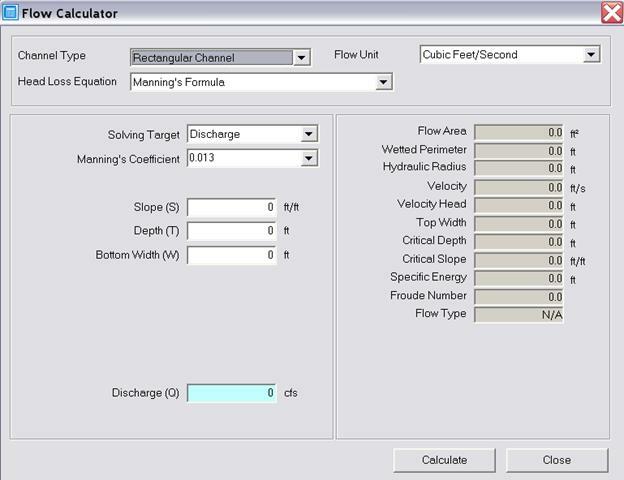 Tagged as: Flow Calculator (Simple in Innovyze H2OCalc) - Option for SWMM6?